N.B. Research is still to be undertaken on the Hemel Hempstead Gazette microfilms for this period of time. Click to link to principle LG Chronicle web pages. Florence C. Tisoe. Mrs. Key no longer resided at Chambersbury, instead it was in the hands of Joseph Bailey, who was a farmer. There were quite a few changes within the commercial population of the village. The "Masons Arms" was the only pub to have retained its landlord, the others changing. The "Leather Bottle" now had William John Bloomfield as licensee, The" Rose and Crown " Samuel Copp, and the "Red Lion". George Timson. James Cooper was no longer listed as a hay dealer, but Joseph Cooper and William Cooper both were. It seems likely they were his sons and had taken over the family business. The following were also listed as beer retailers: George Dell, Frederick Harper, and William Lines. Of these only George Dell was present in 1870. Thomas Doult had taken over the brick works at Bennetts End ) now spelt with 2 t's ) from the widowed Mrs. Pratt, though Daniel Norris was still in business. Stephen Cook was still the village cobbler, Thomas Pointer the blacksmith and William Stow, along with John Child, was a wheelwright. N.B. The Hemel Hempstead Gazette's record of events during this period has yet to be fully researched. 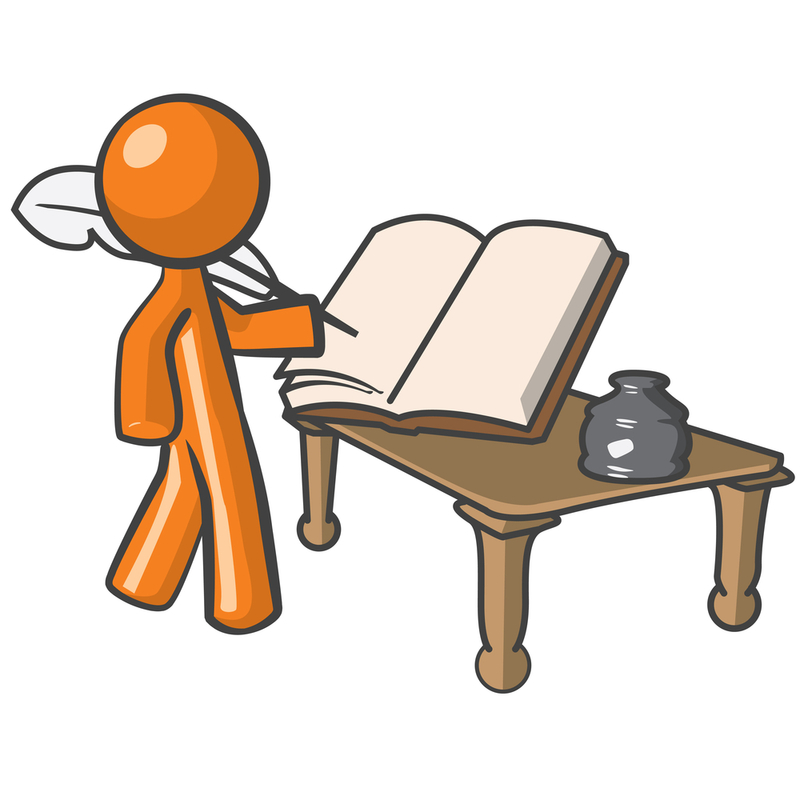 There is therefore likely to be considerable additional material to be added to this entry. 1871. - National census gives the population of Leverstock Green as 1,221. 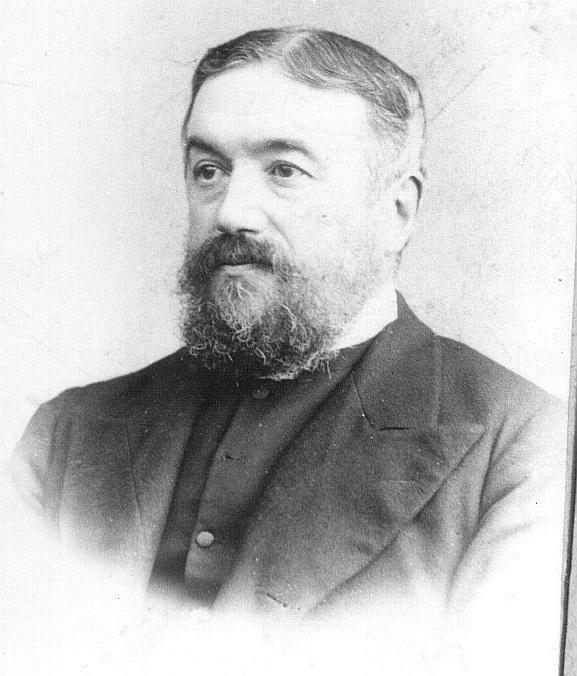 1871 - 1899 - George Finch was installed as Vicar of Holy Trinity. [ S2 ] Despite the proximity of his grave, to Finch tomb and other Finch graves of members of the Finch family from Corner Farm, this George Finch was no relation. Leverstock Green Vicarage, Hemel Hempstead. - -University College Oxford, BA 1857, MA 1862 Ordained Deacon 1859, priest 1861 Nor. Vicar of Holy Trinity Leverstock Green diocese of St. Albans 1871 (Patron, Trustees; TRC £42, av £34, Fees £5, Eccles Comm £195, other sources £30; Gross Income £264 Net £252 3 a of Gl; Pop 827. Formerly C of W of Dereham 1859-62; St.Stephens, St. Albans 1862-64; Chiddingfold Surrey,1868; Chicheley Bucks 1869-71. For more information on George Finch click here. "William behaved so badly in dinner that I was obliged to lock him out." "So much affected by the intensity of the cold, several of the children were quite paralysed with it." "Two girls wrote what they could remember so well on their slates, that I allowed them to copy out what they had written on to paper. "Children read XXII Revelations. A moral influence pervaded the school throughout the day - no need for corporal punishment." December 1871. - Life as Village school mistress proved too much for Hannah Mayhew, and she resigned her post. "15 young and powerful cart horses and colts, and 8 well-bred cows, steers and heifers" The modern implements for sale included 5 farm carts, various ploughs, seed drills, harrows etc. and a 3-horsepower Thrashing Machine. October 28th 1874 - This was the date of the auction sale at Kettlewells Farm (at noon), of Thomas Holinshead's furniture etc.. prior to his emigration to Australia. Although most of the livestock had been sold at the previous auction, this sale also included " 2 useful active nag mares, a Stanhope Gig, about 50 head of poultry and 9 head of geese." Ashwell A. ,Ashwell A., Ashwell E., Ashwell L., Atkins A., Atkins H., Child A., Child J., Child E., Cook W., Cooper H., Cooper J., Cooper W (a), Cooper W (b), Currel J., Currel S., Dell F., Dell E., Fickling C., George A., George H., George M.A., Harrowell M.A., Jackson A., Jury S., King W., Latchford J., Latchford A., Mardle E., Martin J., Martin M.A., Payne E., Peddar M.A., Sinfield W., Sinfield A., Sinfield A., Sleabben W., Slough E., Tarbox E., Turner F., Wheeler J., Woods G., Woods S., Woodward W., Young F.
Saturday 3rd March 1877 - The following report appeared in the St Albans Times and is worth quoting. FATAL ACCIDENT, Mr. Herbert H Day, deputy Coroner, held an inquest on Saturday last at the West Herts Infirmary on the body of William Seabrook aged 57 years who died at the infirmary on the previous Thursday under the following circumstances. William Luck, labourer, of Leverstock Green, said he knew the deceased and they had worked together. Seven weeks ago they were at work sinking a well at Hammerfield belonging to Mr Cranstone. He thought the well was about 30 feet deep when the accident happened. Deceased was on the horse at the top of the well waiting for some mortar when the horse broke and he fell to the bottom. The rope did not break and the witness thought it happened through the deceased not having hold of the rope with both hands, thus causing extra weight on the horse. They had frequently been down the well on the same horse without any accident. A fellow workman named Ginger went down the well and tied deceased on the rope and they pulled him up. He said "I'm a done man". They were all good friends and sober. A cart was sent for and deceased who was a heavy man and the foreman was conveyed to the infirmary. The wood used for the horse was ash and was cut in the middle to about one inch through it. Thomas Ginger, labourer of Bennetts End corroborated last witness and said the stick was chosen by the deceased and was used as a makeshift, he having a better and stronger horse at home which he had forgotten to bring. Deceased and witness had both been used to well sinking. Mr R Z Pitts, house surgeon at the West Herts Infirmary, said the deceased had sustained serious injuries, three or four of his ribs were broken, the lungs injured, the left knee joint fractured, ands the spine injured. Deceased told him it was an accident. The Jury returned a verdict of accidental death and expressed an opinion that a stronger piece of wood should be used in such cases. 1878 - The first edition, 25" to the mile O.S. map was now fully available for the whole of our study area, varying parts having been surveyed in 1873,1877 & 1878. As the first extremely accurate map of the village it can tell us a lot. The maps very clearly showed the "Liberty of St. Albans" boundary running in a straight line through the line of Crofts Path, and up through Green Lane, dividing all the area to its SE into the Liberty of St. Albans (a hangover from the days of the Abbey ), and all the land to the NW of this boundary into a different diocese. 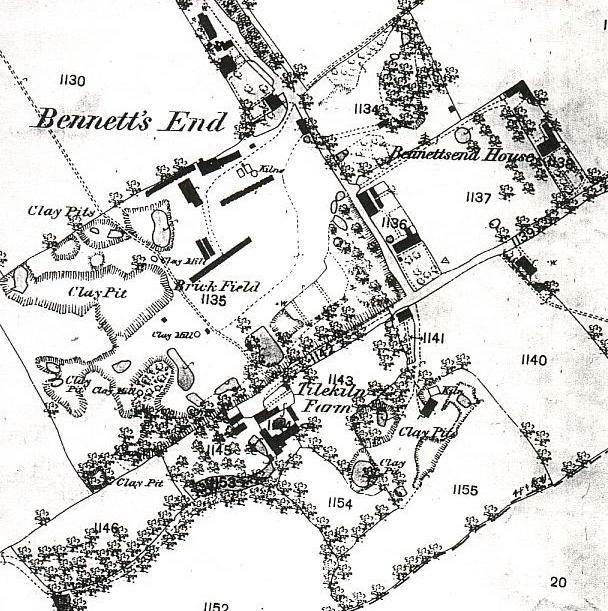 The area known as Bennetts End is shown very clearly, and consists mainly of a large brickfield with several clay pits, 2 clay mills and some kilns. (This where St. Albert the Great School now is.) There were quite a few dwellings at Bennetts End, mostly consisting of several blocks of terraces which presumably housed the brick workers, and what I took to be the "Bricklayers Arms" although it wasn't labelled as such at the time. (This building is still there, but is now on the Adeyfield side of the duel carriageway and is an off license.) The 16thc. house now known as The Old Cottage, was shown as divided into 3 units, and was surrounded by a small orchard. Tile Kiln Cottage was shown, but also divided into 3 dwellings, and the lane from there led up to Tile Kiln Farm. Further clay pits were shown between these two properties and what is now Crofts Path. Bennetts End Farm ( now a listed building ) was very clearly shown on the other side of Bennetts End Lane ( later St. Albans Hill ) forming a staggered crosssroads with the end of Tile Kiln Lane. The other substantial dwelling shown in this part of the parish was a largish house then known as "Bennetts End House", which stood back from Tile Kiln Lane, a little further down towards the village, on the left hand side. On subsequent maps this house continually changed its name, and as Bennetts End Farm, eventually became known as Bennetts End House, it leads to some confusion! Several of the dwellings at Bennetts End still remain, but have been converted into single dwellings rather than terraces in most cases. Apart from this compact grouping of brickworks and buildings, this area was all fields except for Hobbs Hill Wood. On sheet XXXIV 9, which showed most of the rest of Leverstock Green, the overall impression is one of an agricultural area, with settlement strung out along the Leverstock Green - Bedmond Road, with a cluster of dwellings in the centre, corresponding with today's village centre. A pond was shown in the village, roughly in front of where the cricket club is toady, another was shown behind Church Cottages. These various ponds probably represented the water supply for the various houses etc.. The village green didn't exist, instead a large field stretched between North End Farm and the village. North End Farm itself was shown surrounded on three sides by small orchards. A little way from the farm a chalk pit was shown, approximately where Barra Close is now. Wide "greens" of grassy areas were shown on either side of the stretch of road coming into the village from High Street Green. Three pubs were shown on the map: The Leather Bottle, The Rose and Crown and The Red Lion. Along the Bedmond Road from The Rose and Crown ( now a private house) were Northend Cottages ( then divided into 3), The School , The Baptist Chapel, Sibleys Cottage and Sibleys Orchard. There was nothing beyond the church grounds ( which were slightly smaller than they are now ) on the NE side of Bedmond Road except for fields. Blackwater Lane was as it is now, but with no houses on either side of it at all. There was however a largish pond on the E. side, indicating where the old Black Water/Black Queen property had been. Chambersbury ( House ) was shown, a substantial dwelling set further down Chambersbury Lane than Sibleys Orchard, on the other side. It had good sized grounds and a sweeping circular driveway approaching the front of the house. The grounds included a wooded area and a pond. Moving along Bedmond Road, an old clay pit was shown near Well Farm. The only building shown up Pancake Lane was the original Vicarage. Pancake Wood stretched from the Vicarage up towards Westwick Row. On the Hemel Hempstead Road going towards St. Albans, only the Red Lion P.H. and the old half timbered cottage were shown. Further along towards St. Albans, Corner Farm was shown with 4 largish buildings on the other side of the road, down a short track. There were three or four ponds between there and Beechtree Cottages. Corner Farm was surrounded on both sides by Orchards. There were a largish number of dwellings up Westwick Row. Westwick Cottage was shown as a terrace of three cottages, and a terrace of 7, and another terrace of 4 were shown nearer to Westwick Farm. Returning to the centre of the village, various other dwellings between The Leather Bottle and Pancake Lane were shown, including Rose Cottage. Most, if not all, of these houses are still there today. 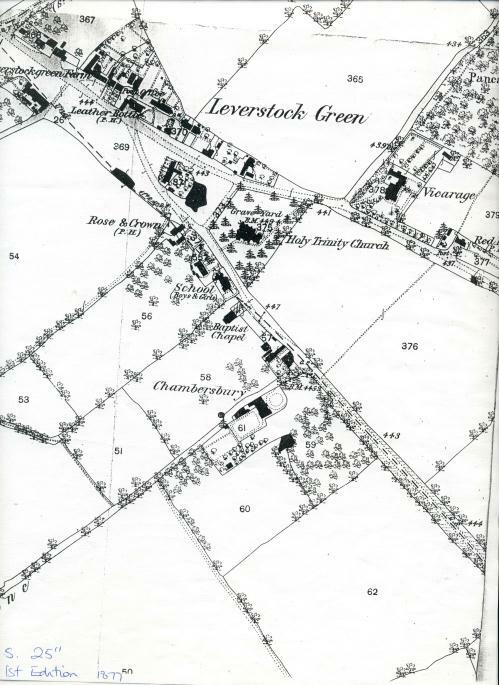 1878 - Kellys Directory for this year gives much the same information on Leverstock Green as it had in 1860/1870, and puts flesh onto the information obtained from the O.S. map. It did note that it was in "St. Albans rural deanery, arch deaconry and diocese" which had been formed the year before. There had been a slight fall in population, the 1871 census showing 1,221 people in an area of 2,000 acres. ( Compared to 1,247 in 1870.) However since that date the new ecclesiastical district of Apsley End had been formed and it was "computed" that the population of the reduced parish was 1,000.